Young Justice -- starring Tim Drake, Conner Kent, and Bart Allen -- is returning to DC Comics, and Brian Michael Bendis will be writing it as the flagship launch of his Wonder Comics line. The series will feature the art of former Superman co-writer/artist Patrick Gleason, who has a history with Damian Wayne and Jonathan Kent, but will be dealing with an entirely different Superboy and Robin (that's right -- Robin, not "Red Robin") this time around. The project was announced (along with the Wonder Comics line more generally and other projects like Naomi and Wonder Twins) at DC's Meet the Publishers panel on the first night of New York Comic Con, then elaborated on (with Gleason being named as artist) during Bendis's spotlight panel on Saturday. Besides Tim, Bart, and Conner, the series will feature a number of new heroes, including Jennie Hex (Jonah Hex's descendant, who comes into an inheritance that includes a trunk full of "old West DC stuff" including an "Adam Strange raygun"), Teen Lantern (who has hacked the power battery to do things he "really shouldn't," Bendis explained), and a mysterious new character named Naomi. Both Conner Kent (who first appeared in The Adventures of Superman #500 as one of four replacements for Superman after the Man of Steel died at the hands of Doomsday) and Bart Allen (who was introduced as "Impulse," Barry Allen's grandson from the future who grew up essentially inside of a video game simulation of life) have been absent and barely acknowledged in the DC Universe since the events of Flashpoint in 2011 and the subsequent DC reboot "The New 52." 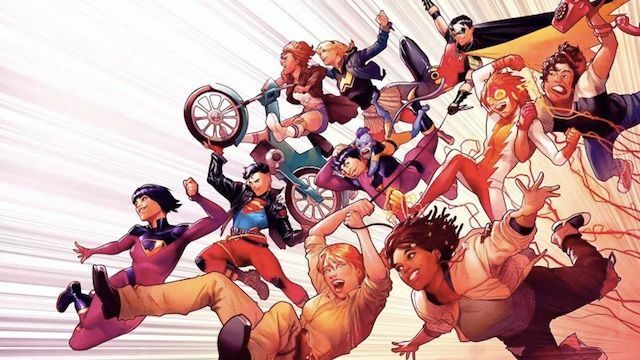 Bendis joked during his spotlight panel that there have been two vocal fan groups at DC who have been asking him for a revival on Twitter since he came to the company from Marvel: Young Justice fans, and Legion of Super-Heroes fans. While the Young Justice fans are pretty happy right now, he said, Legion fans should be patient because "we're building." Members of the Legion of Super-Heroes have appeared after the events of Flashpoint but the team has not had its own title for a few years. Founding member Saturn Girl is currently appearing in Doomsday Clock, leading some fans to wonder whether Geoff Johns would be reviving the series as part of his Killing Zone line of titles for DC. Young Justice #1 from Brian Michael Bendis and Patrick Gleason will be available in stores and online in January 2019.